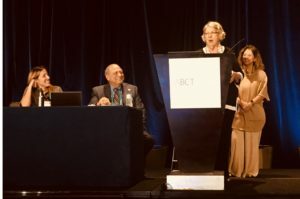 Marsha M. Linehan, PhD, provided her Lifetime Achievement Award address to the Association for Behavior and Cognitive Therapy (ABCT) at this year’s annual conference. Dr. Linehan was nominated for the award by PDBTI Institute Director, Linda Dimeff, PhD. Dr. Dimeff’s Nomination Letter for Dr. Linehan can be found below. 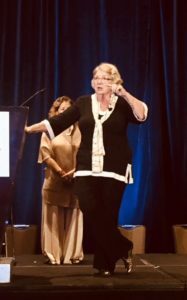 It is hard to imagine anyone more deserving of the ABCT Women’s SIG Lifetime Achievement award than Marsha M. Linehan, PhD, affectionately known by patients, clinicians, and colleagues simply as “Marsha”. There are many signposts that signify Marsha’s significance in the field of behavioral sciences. The most apparent, of course, is her development of DBT for severe, complex and costly BPD patients for whom no treatment was previously shown to work. Her treatment manuals are among the most influential texts in modern psychiatry and psychology: Her skills training manual remains Guildford’s #1 bestseller since 1993 when it was first published; Cognitive Behavioral Therapy for Borderline Personality Disorder has become standard faire in graduate training programs because of its exhaustive and clinically vibrant application of CBT principles and procedures. Within a decade of her seminal DBT publications, her treatment was being adapted and evaluated for use with other populations of multi-diagnostic, complex and severe populations of treatment “failures” and non-responders. Driven by a passion to end the suffering of people who are chronically suicidal, Marsha focused her efforts on building bridges and other pathways to disseminating DBT to ensure its reach worldwide: She developed an efficacious comprehensive training method, the 10-day DBT Intensive Training; an adoption method, focusing on the functions of treatment (verses treatment modes) so real-world treatment settings could adapt DBT to their unique needs while maintaining program fidelity; and a training company (Behavioral Tech, LLC) that has delivered thousands of DBT trainings and implementations throughout the world. Recognizing that DBT practitioners need respite from the stressful work of treating challenging suicidal patients with BPD, Marsha created the Marie Institute to provide low-cost mindfulness retreats. To date, hundreds of clinicians have attended these retreats led by Marsha. When she realized that the fields of suicide and DBT research required young investigators to continue and expand much-needed research, she developed and chaired two strategic research planning groups: the Suicide Researchers Strategic Planning Meeting and the DBT Strategic Planning Meeting (DBT SPM). Both groups were comprised of junior and senior researchers from around the world. They gathered for years at the University of Washington to exchange and critique research ideas and directions. Both groups launched the careers of many early stage investigators and paved the way for innovative research. The DBT SPM continues to meet annually and draws over 60 researchers from around the world. In classic Marsha fashion, participants are required to sign a collaboration agreement to ensure that they work cooperatively (verses competitively) to advance the field. Marsha’s life work has truly and forever changed the world. As extraordinary as her accomplishment are, so too is her indomitable courage and integrity that she has displayed throughout her career. Marsha developed DBT during a time when the only available treatments for BPD were psychoanalytic. Developed by white male psychiatrists, few welcomed the new behavioral approach created by a female psychologist with solid allegiance to science. Many attempts were made to discredit her personally and invalidate her theory and research; these efforts further fueled her resolve to ensure that DBT would survive well beyond her. Once its efficacy was beyond question and reproach, she then boldly answered the question she was frequently asked by her patients: Had she suffered from mental illness? Had she been suicidal? She told her story to the New York Times (NYT) with force and grace. It was front-page news and became one of the NYT’s most popular articles; it continues to serve as a beacon of hope. Before the article was released, however, Marsha made sure that she first told her patients, and then her “nearest and dearest” which she did at the Institute of Living, the hospital where she had received treatment decades earlier. Through stunning brilliance and creativity, decades of unbelievably hard work, and fierce determination to improve the lives of those who suffer from mental illness, Marsha has left a legacy that will live on for centuries. She has cultivated areas of research, communities of scientists and clinicians around the world who are now committed to enhancing the lives of those who are chronically suicidal. It is hard to imagine having a bigger global impact in mental health than Marsha has had in her extraordinary lifetime.